Like LG, Huawei chose to stay away from making any big product announcements at MWC 2015, leaving the spotlight to shine on Samsung and HTC. Even so, the Chinese phone maker is gearing up to launch a flagship of its own, which will apparently arrive as a successor for the Ascend P7 smartphone. The announcement is due in April, with the new device being set to launch as the Huawei P8. The company has been rumored to renounce the Ascend moniker since quite some time and it appears this will indeed be the case. 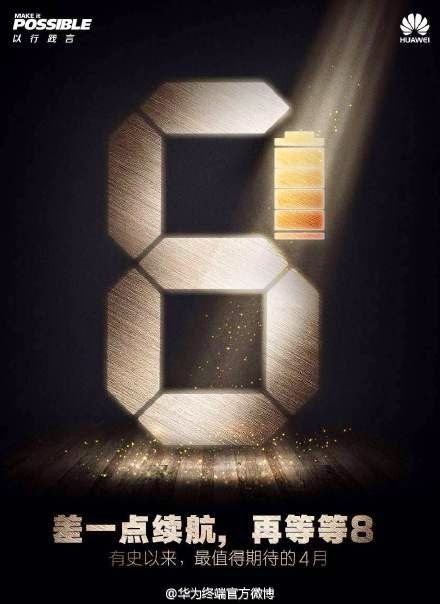 A few weeks before the event, Huawei is teasing the new phone by posting an image on China’s social media website Weibo, displaying a huge digital number 8. But there’s a twist: a segment of the 8 has been replaced with a full battery indicator, and a divine light is shining upon it. Which is the company’s way of telling us that we should be expecting a handset with a huge battery life. However, we can only hope at this point. Sony has already launched a phone, the Xperia M4, that promises a 2-day battery life. Could it be that Huawei will take things even further and launch a smartphone with a 3-day life cycle? Word on the street has it that the new Huawei flagship will arrive with a 5.2-inch FHD display and a ceramic uni-body. As for processing power, the phone will rely on the company’s in-house Kirin 930 chipset, which made a debut inside the MediaPad X2 tablet/phone. The phone will have 3GB of RAM and dual-camera arrangement similar to the one we saw in the Honor 6 Plus.